This is a fun project that is definitely unique. 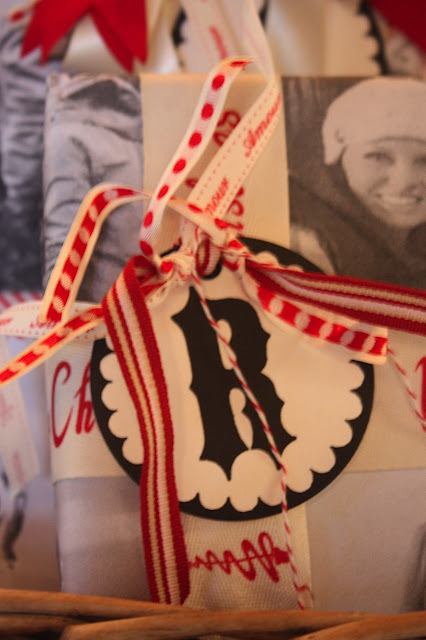 I am going to show you how you can make inexpensive custom wrapping paper using your own photos! I made photo collages in PicMonkey. 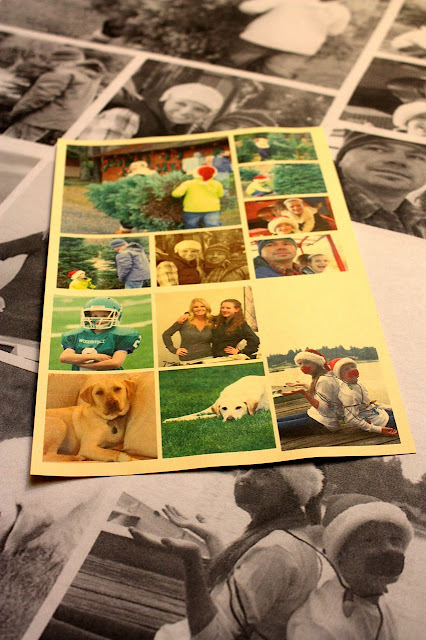 I used photos of our family cutting down our Christmas tree, and other Christmas related activities, but you could use any photos you like. For one sheet of standard paper, I made 2 collages. Save the collages to your computer and then insert them into a word document. You might need to tweak the size just a bit to get them to both fit on one page. 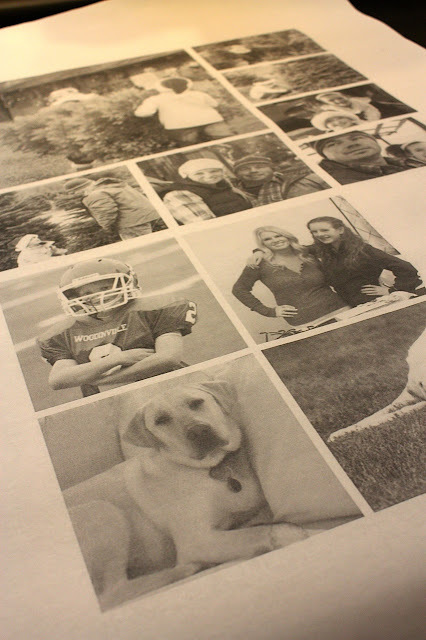 Then print out your photo collage sheet. Next, take your paper to Staples copy center and ask them for an architectural print. You can get really large sizes, but your photos may become distorted if you go to big. I had them do a test sheet first to make sure the photos were not too fuzzy. They will be a little fuzzy however, it's just the nature of this project. To prevent this you can upload your photos on the Staples website first, ordering them right over the computer. The images will be a higher resolution and the overall look will be crisper. Next time I think I will do this. It cost about 55 cents per square foot to enlarge. I made 6 sheets and am going to go back and do more with other photos! Take your wrapping paper pages home and get wrapping! I think this would be a really fun project to do on birthday gifts as well, or anniversary gifts of the couple over the years. Also, my friends at Spark Modern are offering a fabulous deal today only! They are having a Kelly Wearstler SALE - 20% off all Kelly Wearstler fabrics today only!
. Enter coupon code 'KWID20' at checkout for your discount. 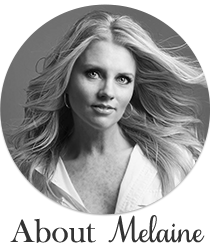 That is awesome Melaine! I am pinning this for next years idea! I don't think I have time for it this year. So cute. I'm going to try that. What a great idea! 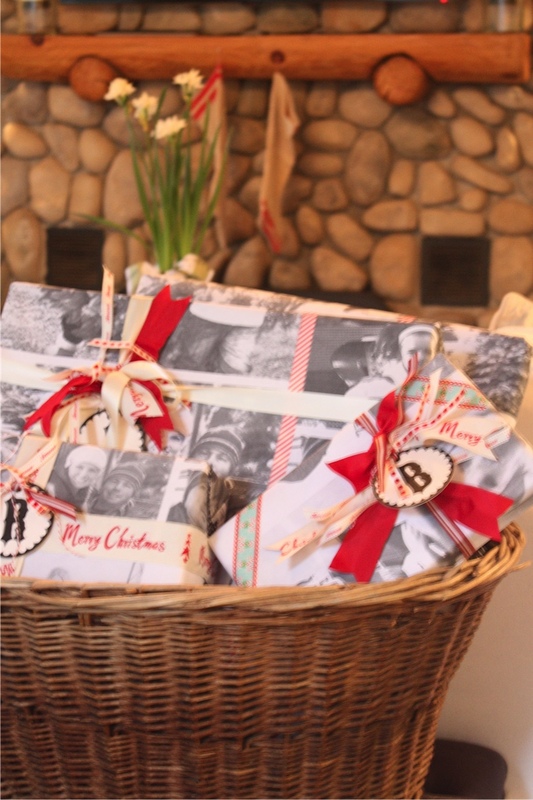 I'm in the middle of the project using the same photo collages (link below) and totally have extra sheets that would be GREAT for wrapping! Thanks for the idea! This is SUCH a perfect idea. I've heard about these industrial prints and have been wanting to go get a huge wedding portrait made...may have to get a few sheets of wrapping paper while I'm there Thanks! Splendid work! That is a project that brings out your creativity and resourcefulness. Who would have thought a photo paper can be made into a wonderful wrapping paper?